I’ve arrived! That’s what the merchant Rudolf Marburg from Frankfurt thought as well when he had his country home built in Spessart in 1884 – that’s how the Villa Marburg came into being. To this day, the historical villa with a modern annex is known as a place of retreat in the heart of Germany, that not only offers its guests escape from everyday life, but also lets them experience true moments of enjoyment. Our restaurants ensure culinary explosions of tastes, which stay in your memory. Luxurious rooms with the highest comfort and cordial service in a familiar atmosphere make the stay perfect. Villa Marburg is also an ideal starting point for any and all kinds of exciting excursions. Visit the breathtaking wildlife park and explore dizzying heights in the climbing forest that is nearby with the highest rope slide in Germany. Sports fans can play and run around on the adjacent tennis courts or in the natural swimming pool. The surrounding area of the Villa Marburg offers diverse adventures and new impressions to lovers of nature as well as to culture enthusiasts. 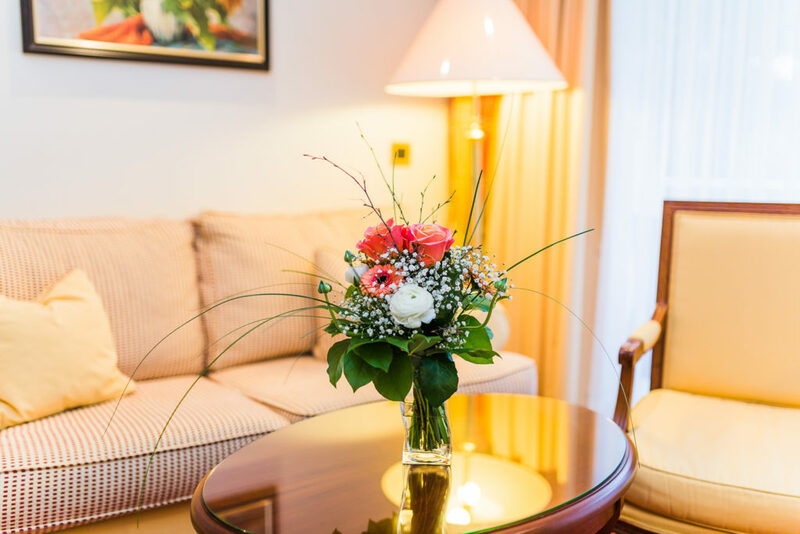 No matter whether you’re searching for romantic togetherness with culinary delights, want to discover the Spessart together with your family, or your company aims to tackle the next project far away from the hectic pace of everyday life – the Villa Marburg offers an unforgettable stay with 76 beds in 38 rooms. Not only is Villa Marburg situated in the heart of Germany, but also in the middle of multifaceted possibilities to discover the surrounding area and experience one-of-a-kind moments while doing so. You’re interested in guided city tours, boat trips or other excursions? Just contact us, we have a wealth of experience and knowledge and will gladly provide you with further assistance! Take a discovery trip and experience the Villa’s surrounding area with its diverse possibilities. You want to reach the very top? You’ll conquer the Spessart forest here in a completely different way! Experiences for all ages – a one-of-a-kind excursion destination for the whole family. Villa Marburg’s extraordinary fusion cuisine has been receiving awards on a regular basis for many years now. For example, our restaurants were given the Bib Gourmand for the best price-performance ratio. Far more important, however, is the opinion of our guests! In the future, we will be looking forward to reading your feedback on Holidaycheck or Tripadvisor, too.